If you’re an athlete who hasn’t tried yoga yet, it’s time to kick off those sneakers, and stretch out those hamstrings. 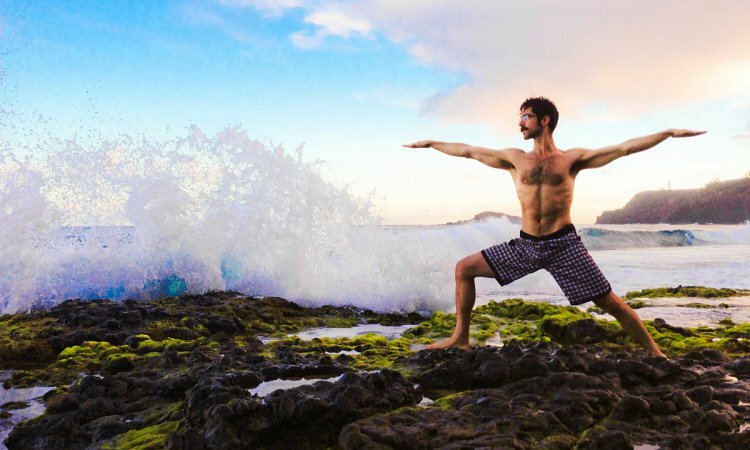 Yoga is about to improve your game, and your life. With a multitude of physical and psychological benefits, these yoga postures will help you warm up, and prepare all the right places before you step out on the court. Regular yoga practice will help reduce injury by loosening the muscles before a game, improve balance, reduce post game soreness, and calm the mind. Plank is often thought of as a core strengthening pose, which it certainly is, however it is also great for building strength and stretching out the wrists. Hold Plank Pose, activate your core, and slowly rock forward, and then back. After a few of these, try rotating your hand, one at a time, out to the side on the mat. As your hands face forward in normal Plank, we are turning our wrists to the left, then back to center, and to the right, then switch sides. Holding Plank can be difficult, so feel free to come down to Child’s Pose and take a break when you need it. Warrior II will give you time to focus, breathe, and work on balance, while strengthening the arms and stretching out the shoulders and leg muscles. Warrior II will also warm up the ankles with the slight rotation in the back foot, and the front foot holding steady. Switch sides, and relax your game face. You have yoga on your side. Consider the amount of impact all that running and jumping has on your hips and lower back! Stretch out before and after with Pigeon Pose to open the hips and groin, assist in recovery, and strengthen the lower back. If you are comfortable, and would enjoy a deeper experience in this pose, bring your head towards the floor, and rest it on your folded arms in front. Follow this pose with a Forward Bend, and enjoy all the goodness of these poses coupled together. Here comes the hamstring stretch! A nice Forward Bend will loosen and warm the hamstrings, and believe me, you will feel it. This is definitely a pose that would be beneficial before and after a game. Our muscles tend to tighten after a workout, and some yoga poses post game will assist in reducing that tension. Forward Bends will also help lengthen those muscles in your lower back. Especially since you are chasing that ball up and down the court, your feet pounding on the floor, that force and impact is going right to the lower back. This pose works a variety of areas; the adductor and abductor muscles, your core, and provides a stretching of the upper and lower back, along with opening the hips. It also warms up the shoulders, gives a nice stretch to the groin, spine, waist, and opens up the chest and lungs. Extended Side Angle Pose will also provide stretching and strengthening of the legs, knees, and ankles. A regular yoga practice will benefit your life, on and off the court. As always, listen to your body, acknowledge your limits, and respect them. Flexibility is not a requirement for yoga, it’s simply a benefit that comes with it. These are some of the more practical yoga poses that just about anyone can do, but with so many to choose from you can always switch them up, and decide which work best for you. So when you’re racking up the scoreboard, and people ask where you got the skills, share with them the message and benefits of some asana-kicking yoga.